Still use iTunes to transfer your fancied eBooks to iPad? With amazing and easy-to-use Xilisoft iPad PDF Transfer, you can skip the step to transfer eBooks to iTunes firstly and then transfer them to iPad. 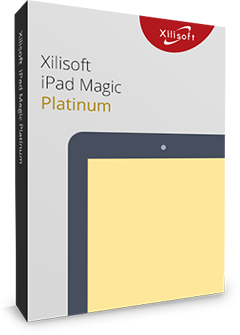 Xilisoft iPad PDF Transfer enables you to transfer the most common-used eBook formats PDF and EPUB files between iPad and your PC directly without iTunes and backup PDF and EPUB files in iTunes for further usage. Besides a file transfer, Xilisoft iPad PDF Transfer also allows you to customize the PDF and EPUB files by editing information, like name and author. Transfer PDF and EPUB files from PC to iPad/iPod touch/iPhone in surprisingly fast speed and reliable quality. Save the step to transfer files to iTunes firstly. Backup PDF and EPUB files in iPad/iPod touch/iPhone to your local computer, no more worries about files missing or broken. This PDF to iPad Transfer is compatible with iTunes and you can also backup all the PDF and EPUB files in iPad/iPod touch/iPhone to iTunes. You are able to edit basic information of PDF and EPUB files, like name and author. You can also rate or give personal comments on files. File search is enabled by given file filter. Search files by entering file name, file size, author or file type, easy and effective in this iPad PDF Transfer. Compatible with most iPad, iPod touch and iPhone versions, such as iPad, iPad 2, iPad 3, iPad 4, iPad mini, iPad mini 2, iPad mini 3, iPad mini 4, iPad Air, iPad Air 2, iPad Pro (12.9/9.7/10.5 inch), iPod, nano (5th Gen), iPod mini, iPod shuffle, iPod classic, iPod touch, iPod touch 4, iPod touch 5, iPod touch 6, iPhone, iPhone 3G/3GS, iPhone 4, iPhone 5/5S/5C/SE, iPhone 6/6 Plus, iPhone 6S/6S Plus, iPhone 7/7 Plus, iPhone 8/8 Plus, iPhone X, iPhone XS, iPhone XS Max, iPhone XR. Display all detailed information of the devices connected, such as mode, capacity (used and left), version, serial number and format. This iPad PDF Transfer offers amazing high-speed in transferring PDF and EPUB files to devices. Batch files can be transferred simultaneously to save time when transferring iPad PDF to PC and transferring PDF to iPad. Auto-exit the application, shut down, hibernate the computer, or do nothing by presetting post-task actions. Up to 8 lingual interfaces: English, German, Spanish, French, Italian, Japanese, Simplified Chinese and Traditional Chinese.